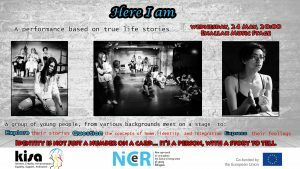 On Wednesday, 24th of May 2017, the performance “Here I am” will be staged at the ENALLAX Music Stage at 20:00. The performance is a blend of unique stories – a unique, innovative, collective creation of young refugees, migrants and locals who participated in the workshops of the NiCeR Project implemented in Cyprus by KISA. A diverse group meets on stage to share their stories, explore themselves and express their feelings through music and theatre. Their life paths are intersecting lines; their personal stories interweave. Based on the techniques of improvisation and Image Theatre, the participants explored questions and concepts like home, identity and integration. How do we find our identity? Who defines who we are? How do we find our place in society? Are we just a number on a document? What is a home? On their journey to self-discovery, they discovered each other, they challenged their limits and following the thread that unites them, they have discovered common values. After the end of the performance, through an interactive journey, the audience will have the opportunity to get in touch with the story behind an identity, thus completing its experience and hopefully reducing the distance to what we call “foreign”. The performance is free and open to everyone. It will be an interesting, interactive, intriguing and integrative experience! You have to be there! The performance is part of the transnational project “NiCeR – Innovative Methods for the Integration of Young Refugees“, co-financed by the European Union and implemented in 6 European cities: Rome, Brussels, Seville, Liverpool, Nicosia and Berlin. The main aim of the project is to enforce the social and cultural integration of refugee youths through the performing arts approach and awareness campaign.